Twice a year, the normal class traffic that dominates the area of 13th Avenue, between Kincaid and University streets, is replaced with food, fun and excitement. This change of pace is known as the Associated Students of the University of Oregon Street Faire. 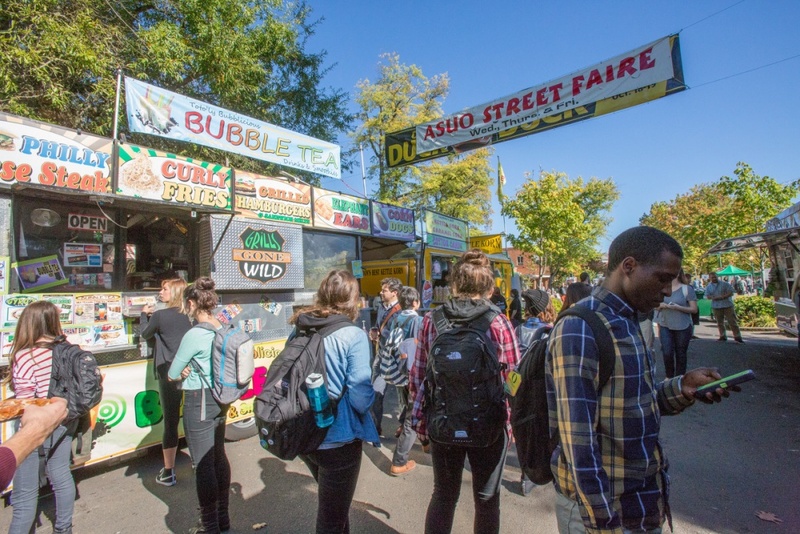 The ASUO has organized street fairs on campus for more than 40 years. However, this spring's street fair, running May 9-12, has some new activities planned for attendees. For the first time, ASUO is placing 50 percent of the proceeds from the street fair into a food security fund to develop food pantries on campus and other food programs to help students in need. The 2017 fall street fair accumulated more than $10,000. Kacie Van Stiphout, ASUO special events director, is hoping to meet and exceed last fall's street fair earnings. "It's fun because it's like you get to buy food, and maybe a succulent plant, but you're giving back and it's good," Van Stiphout said. As well as donating proceeds from this spring's street fair, ASUO is planning on organizing a beer garden in the Erb Memorial Union amphitheater. Falling Sky Brewing is working with the university to offer two kinds of beer to students, faculty and community members who are 21 and older. In hopes to ensure campus safety, the beer garden will be open Friday and Saturday from noon to 5 p.m. There will be a two-drink maximum. Safe Ride and the ASUO Designated Driver Shuttle will be on standby to offer patrons a safe ride home. In addition to the beer garden, games like Jumbo Jenga will populate the area outside of the EMU amphitheater. Students can find anything from a warm bag of kettle corn to body jewelry at this spring's street fair. "There's like everything. If you're not in the mood for something you'll figure it out and be in the mood for something, I promise," Van Stiphout said. For the first time, a high-protein, low-fat ice cream cart, founded by a UO graduate, will be added to the fair's growing list of vendors. Student organizations and other nonprofits will also have booths at this spring's street fair. Organizations such as Global Education Oregon, Summer Creek Church and Planned Parenthood will head to 13th Street amidst ice cream, Korean cuisine, bonsai trees and more. ASUO isn't the only group involved in assembling the fair. More than 25 UO students, staff and faculty members helped organize this spring's event, as well as 138 volunteers. Volunteers receive a free T-shirt as well as a free elephant ear for their time and hard work. To learn more about the ASUO street fair or register as a volunteer see the "ASUO Street Faire" website.